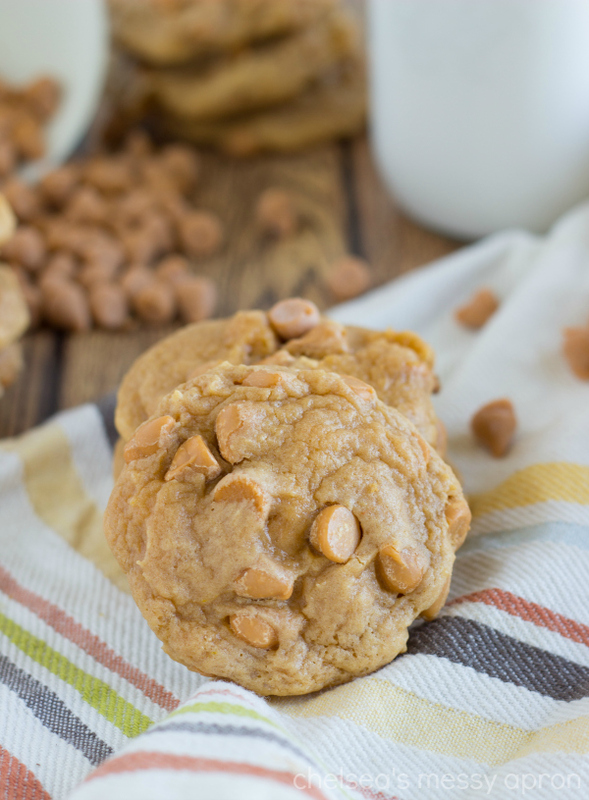 The softest and chewiest butterscotch cookies, sweetened with butterscotch pudding and chips. The absolute best! So, our friends gave us four (maybe five?) bags of butterscotch chips. Basically, it felt like my birthday. I can never, ever have enough baking chips! It’s a little ridiculous how many bags of baking chips are in my pantry and how many end up in my cart every.single.time I grocery shop. And then I got home and thought, what should I use four (maybe five?) bags of butterscotch chips for? And instead of thinking of something ultra creative, my mind went where it usually does when I think about desserts….cookies! I know. Not super original. But they kind of are super original! These cookies are the softest, lightest, CHEWIEST cookies ever. 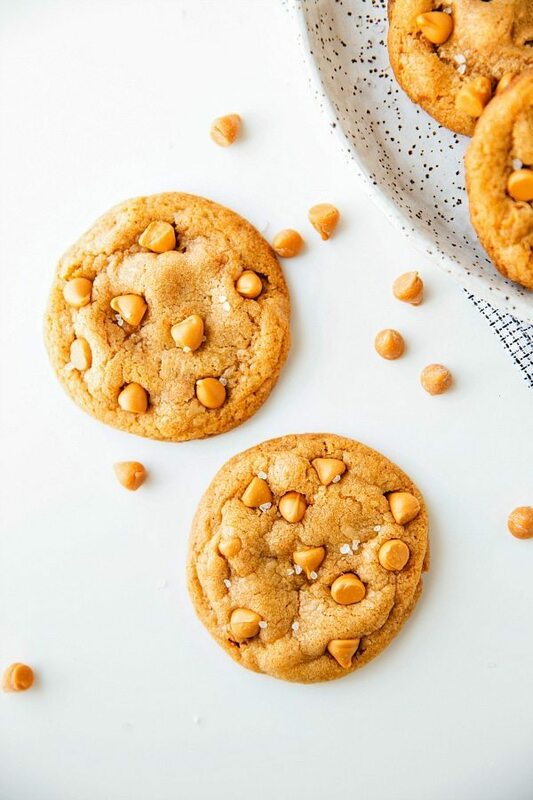 They are bursting with butterscotch flavor and pretty much melt in your mouth. The ingredients that make them softer? First, butterscotch pudding! Second, the cornstarch, and third a little bit less flour. All three contribute to an ultra-soft and chewy cookie. The butterscotch pudding also contributes to the overall butterscotch flavor along with those butterscotch chips of course! 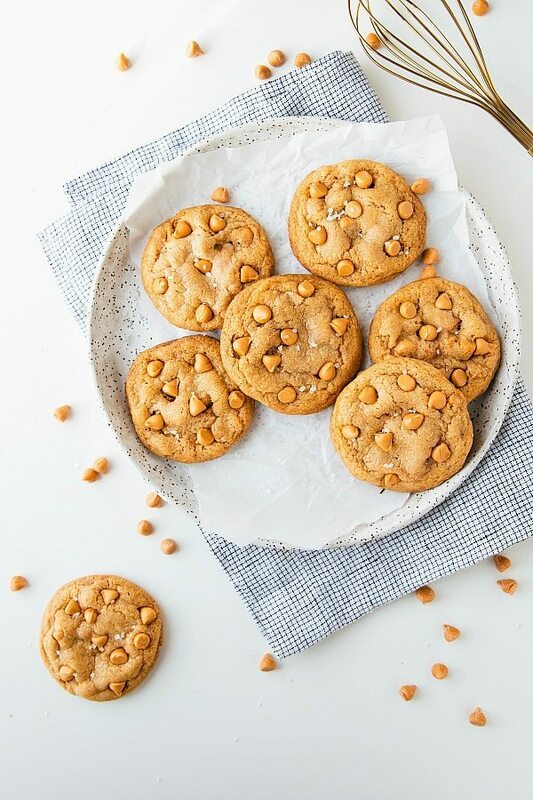 This recipe calls for a lot of butterscotch chips because I love every single cookie bite to have a few chips in it. However, if you like them more sparse, start with 1/2 cup of chips and increase from there. Cream together the butter and both sugars until creamy or about 2-3 minutes. In a separate bowl, combine the pudding mix, flour, baking soda, cornstarch, and salt. Stir and then slowly combine the dry and wet ingredients. Fold in the butterscotch chips. Cover the dough and chill in the fridge for at least 30 minutes to an hour. Roll cookie dough balls that are about 1.4 ounces in size (if you have a food scale). Roll them into tallish balls and place on a cookie sheet prepared with a nonstick cookie liner (or parchment paper). Bake for about 10-14 minutes. By slightly under-baking the cookies, they will remain very soft and chewy. So pull them out slightly under-baked and allow to cool on the cookie sheet for a few minutes before transferring to a wire rack. Soft cookies are the best!!! I still haven’t tried pudding mix in cookies – I need to! Yours look so perfect!! Hope you have having a great Easter weekend! Pinned! These look amazing. 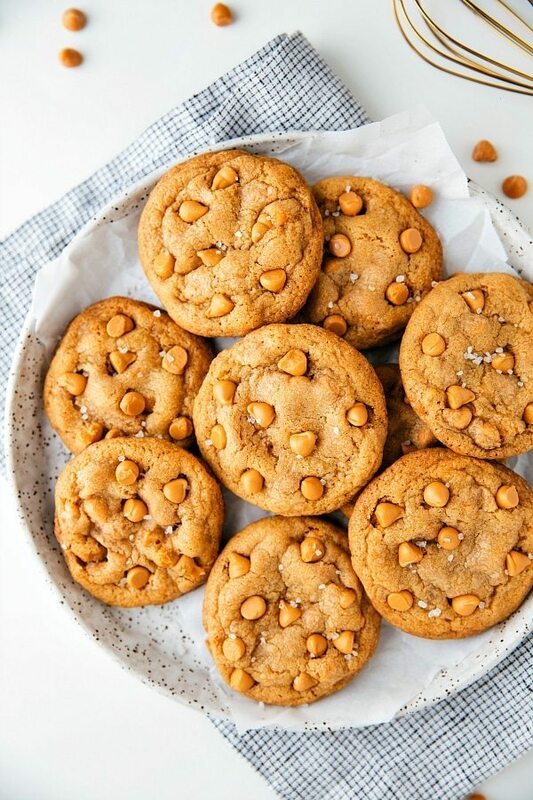 Butterscotch chips are one of my favorite baking ingredients. Can’t wait to try this recipe! 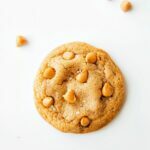 These butterscotch chip cookies look wonderful, great photos! I just found a box of butterscotch pudding in my pantry!! Guess I know what I’m going to make 🙂 Yummy! Using pudding mix in your cookies is so cool!! I have never tried it! Totally going to now. Happy Easter! Oh my – I love butterscotch – I may have to make these. Chelsea, these look delicious! 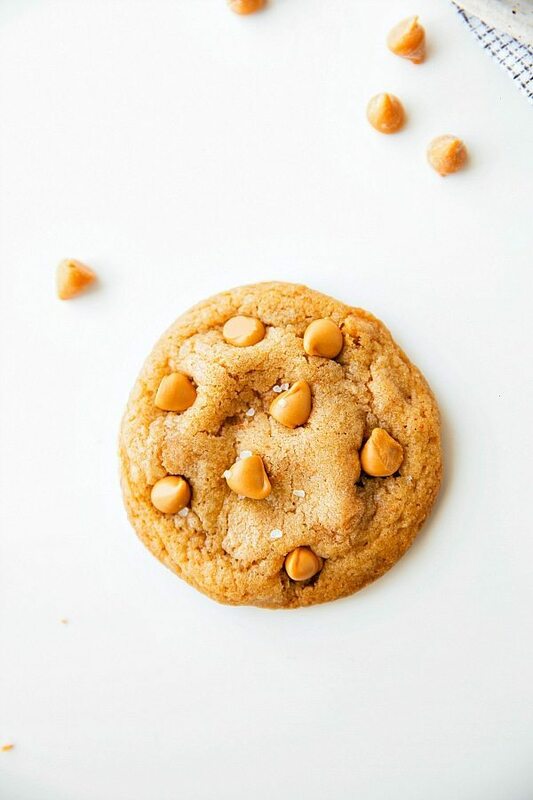 A soft, chewy cookie just screams freshness. 🙂 I am always on the lookout for care package cookies that stay soft as long as possible. These have pudding mix and cornstarch that I find are key ingredients to longer lasting softness! Do you have any idea how long these stayed soft? Thanks! Thank you so much Wendy! I think it is so sweet you send care packages to the military – so amazing of you! So to be honest, these cookies didn’t last long in my house! Probably about 4 days and they were all gone. They remained very soft that whole time. I’ve found under-baking is definitely the key to having them really soft. Sorry to not be of more help! These do look incredibly soft … soft cookies leave me helpless and utterly without self control. Dramatic? Yes, but completely true! 🙂 The butterscotch twist sounds amazing! Thank you for the lovely recipe, I am going to try it this week. The recipe does not state when to add the dry butterscotch pudding mix, I am guessing with the dry ingredients, but don’t know for sure. Can you clarify? I bet they’re soft!! OMG cornstarch and pudding. These are probably the best cookies ever! Thanks Dorothy! 🙂 Hope you are having a great week! I love soft cookies! I also love butterscotch, so these would be perfect for me! Thanks for sharing this at the In and Out of the Kitchen Link Party! I love butterscotch and now you got me craving it ! One of those flavors that just doesn’t get a lot of attention. Thanks for sharing the recipe! I have no doubt these cookies are very delicious! Is there a way you could make them without the pudding? Not for this recipe; the pudding is very integral to the flavor and texture. Sorry! Does this recipe take instant pudding? I am so thrilled to hear that! 🙂 Thanks so much for the comment Kieriana! Sure, as long as the amounts are the same that will be fine. The flavor will be less butterscotch of course, but still delicious! These look awesome; have to try. These are great but all of my cookie samplers said the cookies from this recipe are almost too sweet! I’ve learned to cut down on the pudding mix and only do 1/2 cup of the chips. But, this recipe overall has gotten many compliments and I continue to use it! These are delicious! I didn’t have butterscotch pudding mix in my pantry and used chocolate instead, so good. Used full amount of chips–I have three boys and not one of them complained about them being to sweet, lol. Thanks! Should I use a dark non-stick pan or a light pan? These are wonderful! Have you ever tried to refrigerate the dough for longer? I hoped to make the dough ahead and bake them fresh for my daughter’s birthday. That should be fine! 🙂 Enjoy! !